8 Publications by "S. Meena"
User driven interactive image segmentation provides a flexible framework for obtaining supervised object detection in digital images. We have recently proposed a novel user seed points based interactive segmentation approach with spline interpolation. In this work, we combine interactive segmentation method with a web based tool for visualization, segmentation, and tracking tool called Firefly. It is based on a Client-Server model written in Flex and PHP which uses MySQL database for storing the annotations. Firefly provides an automatic analysis of segmentation results by executing MATLAB scripts in the background. We provide user cases in segmenting natural, and biomedical imagery which requires minimal effort and no storage requirement on the user side. 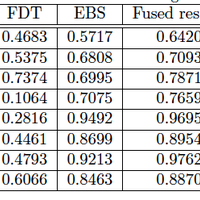 keywords = "segmentation, interactive, gaussian elastic body, splines, firefly, visualization"
U. Sampathkumar, V. B. S. Prasath, S. Meena, and K. Palaniappan. 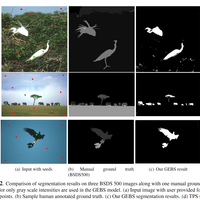 Cloud-based interactive image segmentation using the FireFly visualization tool. Proc. IEEE Applied Imagery Pattern Recognition (AIPR), October 2016. We study a method for extracting blurred or sharp regions of interest (ROI) that could help in initializing an interactive segmentation method using elastic body splines. Accurate salient region detection and segmentation can help many vision applications. In order to detect the ROI we first classify each pixel in an image as either sharp or blurred based the absolute magnitude of the Frobenius norm of eigenvalues from multiscale Hessian matrix. The Frobenius norm would be low in areas of blur relative to the areas that are sharp and in-focus. We use this basic property to mask out the ROI and initialize our novel elastic body splines (EBS) based interactive segmentation technique. Elastic body splines belong to a family of splines and have been applied for the task of biomedical image registration. It models the elastic deformation of homogeneous isotropic elastic body subjected to external forces. 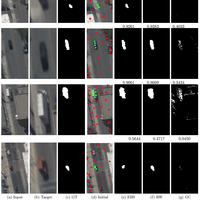 We utilize a logistic regression fusion strategy for combining both focus based saliency map and EBS segmentation. 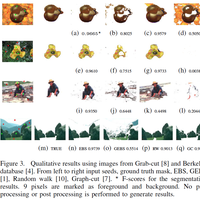 Our initial set of experiments shows promise and has improved the quality of the segmentations over the Hessian based ROI detection and EBS results on natural images. keywords = "interactive, segmentation, focus"
S. Meena, R. Pelapur, V. B. S. Prasath, and K. Palaniappan. Multiscale focus driven segmentation using elastic body splines. Proc. SPIE Conf. Geospatial Informatics, Fusion, and Motion Video Analytics VI, 2016. Commonly used drawing tools for interactive image segmentation and labeling include active contours or boundaries, scribbles, rectangles and other shapes. 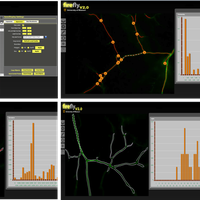 Thin vessel shapes in images of vascular networks are difficult to segment using automatic or interactive methods. This paper introduces the novel use of a sparse set of user-defined seed points (supervised labels) for precisely, quickly and robustly segmenting complex biomedical images. 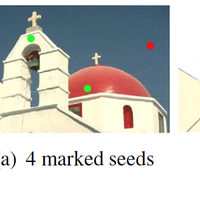 A multiquadric spline-based binary classifier is proposed as a unique approach for interactive segmentation using as features color values and the location of seed points. Epifluorescence imagery of the dura mater microvasculature are difficult to segment for quantitative applications due to challenging tissue preparation, imaging conditions, and thin, faint structures. 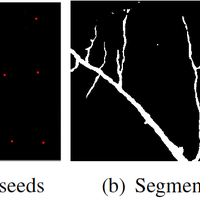 Experimental results based on twenty epifluorescence images is used to illustrate the benefits of using a set of seed points to obtain fast and accurate interactive segmentation compared to four interactive and automatic segmentation approaches. S. Meena, V. B. S. Prasath, Y. M. Kassim, R. J. Maude, O. Glinskii, V. Glinsky, V. Huxley, and K. Palaniappan. Multiquadric spline-based interactive segmentation of vascular networks. 38th IEEE Engineering in Medicine and Biology Society Conf. (EMBC), pages 5913-5916, 2016.